Shoryu Ramen is a Japanese ramen restaurant. It is run by Executive chef Kanji Furukawa and now has several restaurants open in London. It specialises in Hakata tonkotsu ramen, a local ramen speciality from Hakata in Fukuoka on the island of Kyushu in Japan. I visited Hakata in March 2014, and ate a lot of great ramen there. This entry was posted in England and tagged hakata, kirin, London, ramen, restaurant, review, sake on June 6, 2015 by Traveltorgeir. 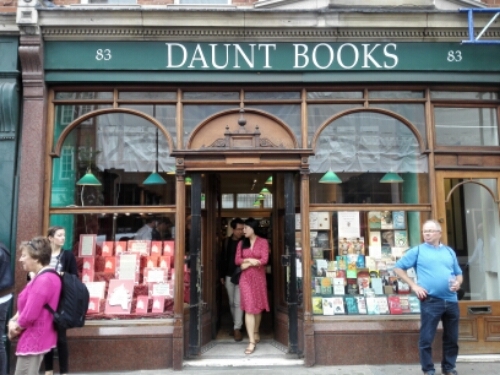 This time in London I visited Daunt Books in Marylebone, a book store I have never visited before but was recommended by one of the readers of my blog. This entry was posted in England and tagged book store, books, London, Marylebone, travel books on June 1, 2015 by Traveltorgeir. My trip to London last weekend is over. I had a great time and would love to return soon. This entry was posted in England and tagged Big Ben, Camden Town, Covent Garden, King's Cross, London, London 10000, the London Eye, the Thames, travel, weekend on May 29, 2015 by Traveltorgeir. I have arrived home from My weekend in London. My plane landed in Trondheim late last night, I went to bed as soon as I got home to at least get some hours of sleep before work tuesday morning. I was very tired at work still. On my last day in London I checked out from my hotel just after 10am, my flight did not leave until 8pm. I had several hours in London to kill, had to make the most of the day. This entry was posted in England and tagged Camden Town, King's Cross, Regent's Canal on May 26, 2015 by Traveltorgeir. This entry was posted in England and tagged Daunt Books, London, Marylebone, Northfields on May 24, 2015 by Traveltorgeir. Today I started by going to Camden Town. Only two stops with the tube from my hotel it is not far away. This entry was posted in England, history and tagged Camden Town, Ethiopian food, London, street market on May 23, 2015 by Traveltorgeir. I took the train from Gatwick Airport to St. Pancras International. My hotel was only a short walk away. At first I planned to take a taxi, but the taxi driver told me to walk instead. It was a fifteen minute walk, but there was lots to see. I set off on my walk, watching themap on my phone. This entry was posted in England and tagged King's Cross, London, the Fellow, walking on May 23, 2015 by Traveltorgeir. I almost missed my flight to London. I thought I had given myself plenty of time to get to the airport, plenty of time even for a small meal and a beer before my flight left. I have travelled from Trondheim to the airport many times, I know how long it takes. This entry was posted in England, Norway and tagged airport, London, trondheim, Værnes on May 22, 2015 by Traveltorgeir. Soon I will arrive in London, I am currently waiting for my flight at the airport in Trondheim. It will depart shortly. This entry was posted in England and tagged airport, airport express, London, trondheim, weekend on May 22, 2015 by Traveltorgeir.